While investigating the UN Report on chemical weapons (CW) use in Ghouta, Syria, we sought a multitude of opinions from experts and others who offered insightful observations. We published our findings in an article entitled: Questions Plague UN Report on Syria. 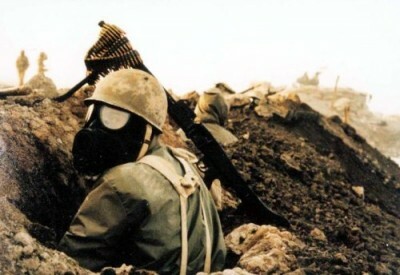 To learn more about Sarin and other nerve gases used in warfare, you would be hard pressed to find any better hands-on experience than in Iran, a country that suffered directly – and repeatedly – from Iraq’s use of CWs during the 1980-88 war between the two countries. In Iran itself, there are few as qualified to speak about Sarin and other nerve gases as Dr. Abbas Foroutan, whose 2004 articles were reviewed in Neurology by Col. Jonathan Newmark of the Chemical Casualty Care Division, US Army Medical Research Institute of Chemical Defense. Upon our request, Dr. Foroutan reviewed the UN Report on Syria and provided us with some critical insights, addressing the issues of environmental and human sampling conducted by the UN investigators in Ghouta. 1. Sarin gas does not cause inflammation in the eye. We have observed many cases during Iraq’s war against Iran and victims presented with only brief and temporary redness in the eye. Here, 22% of cases still displayed inflammation after 5-7 days. 2. Miosis [constricted pupils] has been observed in 14% of cases while disorientation has been seen in 39% of the cases. This ratio is not logical. It is obligatory that complete raw data charts of the patients be published so that the correlation index between signs and symptoms of this case and other cases be calculated. 3. Regarding the 19% convulsion report: the reports from the victims themselves are not acceptable as they would have been unconscious at the time of convulsion. Unless others report the convulsion in the victim, these reports are otherwise unreliable. 4. The prescription of Atropine: this medicine is the most essential antidote for Sarin exposures and if a large amount of it is taken quickly and intravenously, it will save the patient . Rapid recovery of a severe case with high dose of atropine suggest the patient was exposed to a substance similar to nerve gas[sarin]. Unfortunately the information given is very incomplete and it has not been noted how exactly the patients have reacted to this cure. 5. Mentioning the vital signs like the pulse rate and blood pressure, which because of sarin classically become slow and low and subsequently atropine raises it up, is also an important diagnostic sign which unfortunately has not been recorded in the patients documents. Another important sign is auscultation of “wheezing” in the victims lungs, similar to the noise coming from an asthmatic patient, has not been mentioned. This neglection is abnormal. 6. Activity of an enzyme called “acetylcholinesterase” in the plasma and red blood cells will reduced immensely with nerve gases like sarin; and will reactivate (re-synthesize) after weeks until it becomes normal. Sarin is an acetylcholinesterase inhibitor substance. Experts across the world are well informed of the importance of this lab data[reporting enzyme activity]. During the holy defense (Iran Iraq war) we would measure it in the frontline emergency center as a routine diagnostic test. The importance is that in moderate to severe cases, it decreases heavily without exception. Why has this examination not been done? 7. The claim of the identification of sarin molecules a week later in the biological samples needs an exact report of methodology of measurement for other experts of the world because of the high chance of technical error. 8. Regarding the environmental samples: according to the pictures, a lot of the places have been under the sunlight and due to the fact that sarin is very volatile, the claim of sarin detection should be accompanied with more description by the experts. Overall in my view this report should be received/accepted medically with great caution and should be observed again by a team of international expert clinicians. My intention is not the denial of sarin but at least from the clinical point of view, the evidences of this report are not enough to prove the existence of a nerve gas [sarin] in this incident. “There is a possibility of a false positive recognition/diagnosis of sarin and by-products caused by natural decomposition and impurities with the primary gas. An important point is that it seems the team has set up its experiment methods according to the pre-assumption that sarin had been used. That is why it should be requested that all of the experiment/lab measurements should be published with the details of sample preparation and analysis methods and also even the pictures and files of the curve from the analysis devices. While we were fortunate to reach Dr. Foroutan for his insights on the UN Report, I am publishing this information now because he took the trouble of writing it out and sending it to me via an academic colleague who translated his comments in their entirety.